MJR! 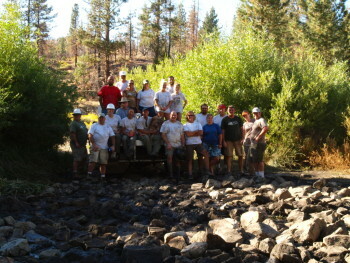 Holcomb Water Crossing Workday Report - MJR! Rick, Tam, Chris, John and I arrived at the gate at 8:45 (on time!) and were greeted by most of the group! After hosting the safety meeting, Doug announced the plan for the day: to continue draining and fill in the remaining creek overflow at the 3N93 crossing. 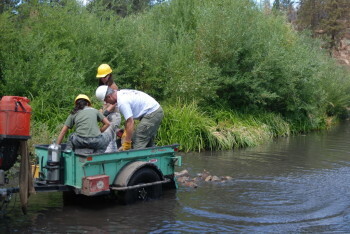 We used pickup and work trucks to cart rocks around from other areas of the trail. At the end of the day, it was almost unbelievable that we completed the job! Trying to do the math, we loaded Kurt with about 2000 pounds per load and hauled 7 loads; Chris hauled roughly 1000 each load; and Karstic hauled about 1000 per load – that is 28,000 pounds (14 tons)! Plus a few more truck loads from others. 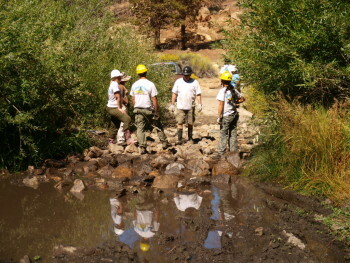 The photos say it all… thanks to such a great crew, and Doug for being the trail leader for the day. 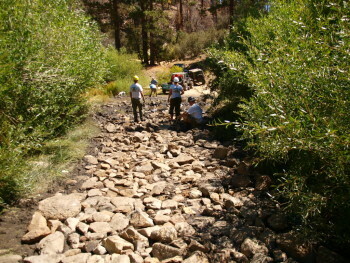 Are you looking for information on land use, conservation, closures, and/or getting involved in keeping our public lands open to public access? Are you trying to figure out what clubs/groups you should join or support?